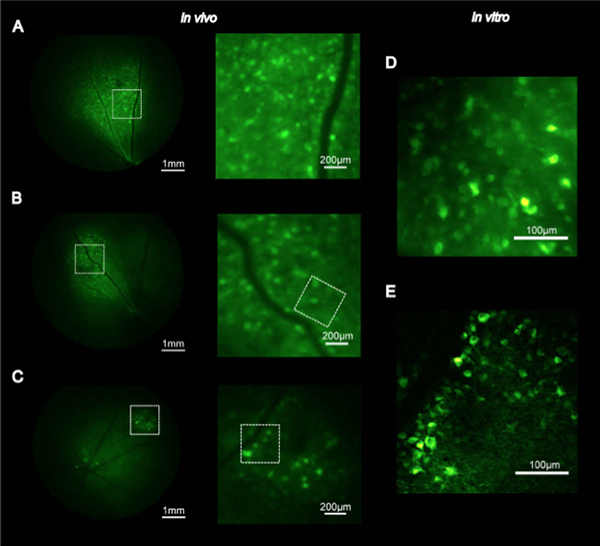 An interesting paper by Adi Schejter, Limor Tsur, Nairouz Farah, Inna Reutsky-Gefen, Yishay Falick, and Shy Shoham published an interesting paper that shows in vivo fluorescent images with cellular resolution using optogenetic probes expressed in retinal ganglion cells by adapting a simple endoscope as a low cost fundoscopic imaging system. The authors were able to resolve really nice, high quality images that reveal the entire retina, showing ganglion cells as well as the ganglion cell fibers expressing a channelrhodopsin2-e YFP construct. Thanks to friend of Webvision, Steve Fliesler for sending this along.